The JCC offers Parenting Workshops at a very affordable rate, not only for JCC Members, but the Community at-large. Workshops focus on a wide variety of topics, all relating to managing the kids. Workshops are Free for JCC Members; there is a $10 charge per adult for Non-Members. All participants must be pre-registered in order to attend the workshops; drop-ins and refunds will not be honored. Registration closes the day before the workshop. Babysitting is available for JCC Members at the J-Care rate by calling 210-302-6820. 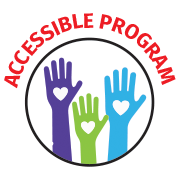 These programs are accessible to individuals that are differently abled. Find out more by clicking the image on the left.